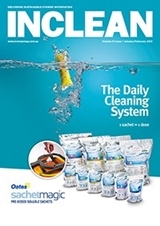 Published for more than 25 years, INCLEAN magazine is the only dedicated cleaning and hygiene industry magazine in the Australian and New Zealand markets. It delivers need-to-know information to contracted and in-house service providers, product distributors and manufacturers. One in every 11 workers is employed in the Australasian cleaning industry, underscoring its economic importance. Even more importantly, the cleaning industry is responsible for maintaining public health and hygiene – a role that often goes unrecognised by the public, government and other stakeholders. Not only is the cleaning industry important in terms of labour, it is also one of the most innovative. A constant flow of genuinely new products and services underscores INCLEAN’s importance in delivering information on efficient and environmentally sustainable products and services. incleanmag.com.au, together with its fortnightly e-newsletter, provides readers with quality content that focuses on the latest news and developments in contracting, carpet and restoration, general management, product and technology, healthcare, as well as legislative changes. incleanmag.com.au also features event listings and ‘Hot Products’.